Dental Assistants play an important role in dental offices. They support dentists as they examine patients, effectively acting as the dentist’s extra hands. If you enjoy active work and communicating with others, Dental Assisting might be an excellent career choice for you. Duties and responsibilities include but are not limited to the following: prepare patients for procedures, sterilize various instruments, make dental impressions, install fixed prosthodontics, and play a supportive role in oral surgeries. Dental Assistants also take dental X-rays, schedule appointments, and instruct patients on how to maintain proper oral hygiene. 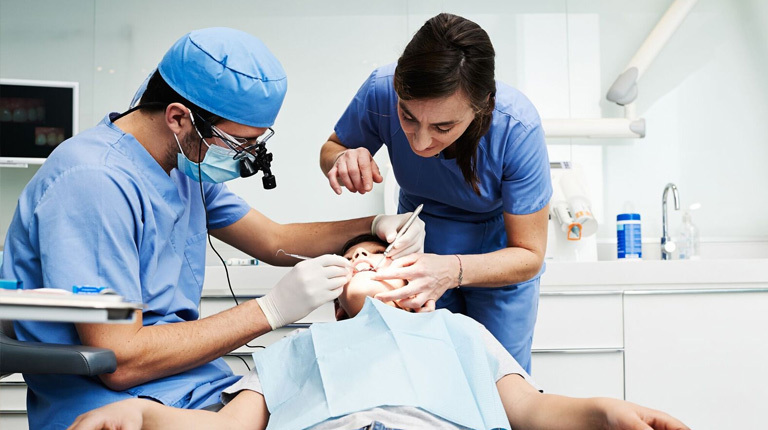 Experts predict that employment of Dental Assistants will grow 19 percent by 2026.1 Ongoing research has linked oral health to general health, and such findings will likely create a higher demand for preventive dental services. This, in turn, will cause dentists to hire more assistants. If you’re looking for Dental Assistant programs in Concord, we encourage you to read our enrollment requirements. Our career-driven curriculum gives students the knowledge they’ll need to excel as a Dental Assistant. In as little as 10 months, students will learn about infection control, sterilization techniques, medical emergencies, dental X-rays, dental instruments, and more. Our program utilizes a well-rounded curriculum that incorporates several learning techniques. These include specialized instruction, simulation exercises, and a 200-hour supervised externship. Unitek College maintains six locations in Northern California and one location in Southern California. Not only do we have enthusiastic career services and financial aid teams, but we also provide numerous programs that combine expert instruction, training exercises, and supervised externships to give students a well-rounded experience. At our Concord Campus, we provide students with 9 labs and 7 classrooms. We also have several learning resource stations, a student break room, and an indoor café. If you’re looking for Concord schools that offer Dental Assistant training, please visit our website or contact us at 888-919-4220. By submitting this form, I agree that Unitek College may call and/or text me about educational services at the phone number provided, including a wireless number, using automated technology. Please note, this consent is not required to attend our institutions and you may always call us directly at 888-775-1514.